Home » humour , Silly-Saturday » Silly Saturday: Stupidosaurus! An ex-schoolmate shared this on Facebook a little while ago. It's just TOO GOOD to not be shared ahead! Filing it here under "Silly Saturday" for some future laughs! 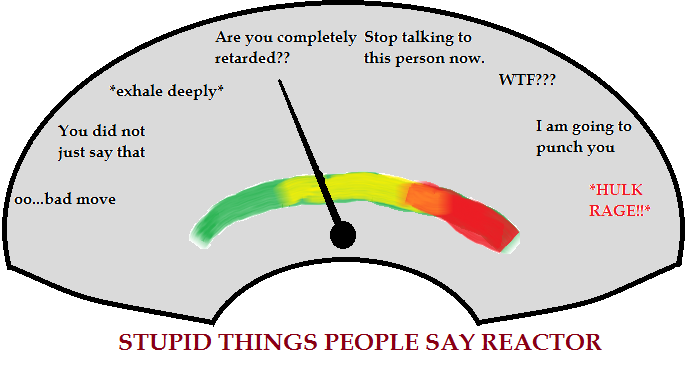 Six most STUPID questions people usually ask in obvious situations... that probably make you see RED on this meter! Me: I sell tickets in black here. Don't you know? A fat lady who steps on my feet: Sorry, did that hurt? Me: No, not at all. I'm on local anesthesia. Why don't you try again? Me: Na! I was doing research on whether monkeys in Africa marry or not. You thought I was sleeping? You stupid fool! Me: Nah! It's autumn. My hair's shedding! 5. When someone calls on land-line and asks where are you? Me: Am in market with the telephone around my neck...!!! Neighbor: Hey are you washing it? Me: No, I'm just watering it so that it grows into a big bus.